For our most recent No Ceilings show, we took it to London for our first ever overseas event. This month, we’re bringing it back to New York City. 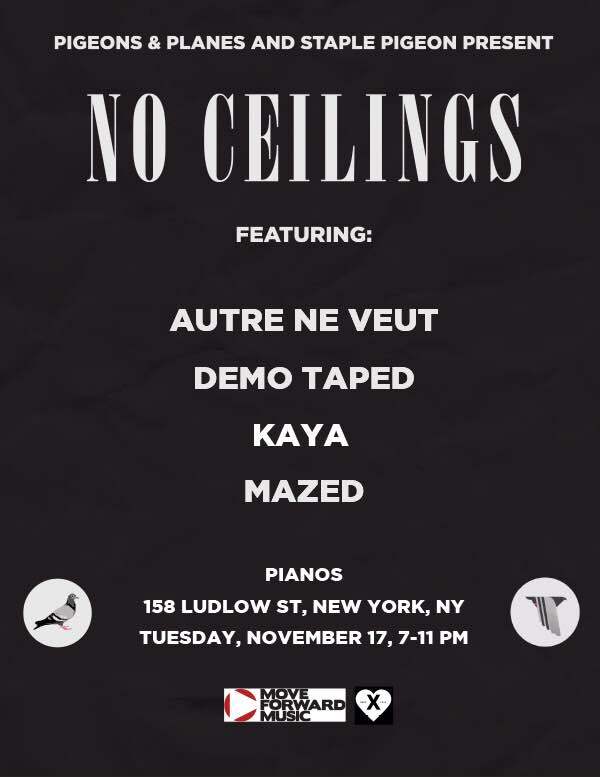 The next No Ceilings goes down at Pianos on November 17, and will feature Autre Ne Veut, Demo Taped, Kaya, and Mazed. Pianos is a relatively small but iconic New York City venue, and it’s a chance to get up close and personal with an exciting, eclectic cast of rising artists. Fresh off the release of his excellent Age of Transparency album, Autre Ne Veut is playing much bigger venues these days. He just sold out Bowery Ballroom, and getting a chance to hear the album in an intimate setting is going to be special. We’ve also got 17-year-old producer/singer Demo Taped from Atlanta, intriguing newcomer kaya, and Autre Ne Veut affiliates Mazed.